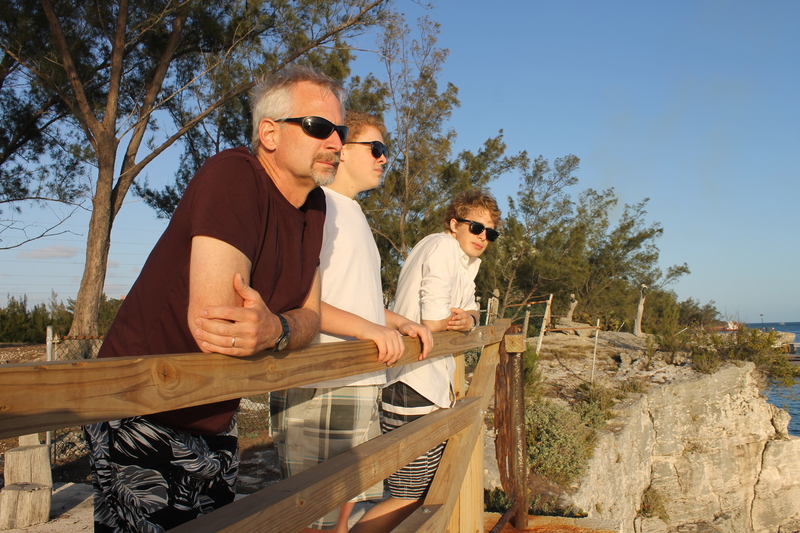 …keeping our focus on Jesus as we serve here in the Bahamas! 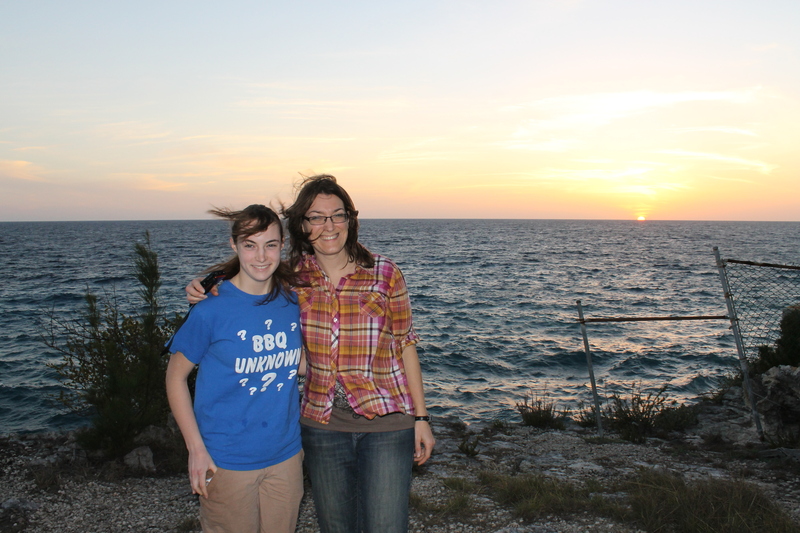 March 29, 2013 8:17 am / 3 Comments on …keeping our focus on Jesus as we serve here in the Bahamas! We are challenged daily by the Word of God that our work and service is not ultimately for the benefit of our selves or others, but it is an act of worship to God. We are admonished by scripture to do all to the glory of God (I Corinthians 10:31), work heartily as for the Lord and not for men (Colossian 3:23), commit our work to the Lord (Proverbs 16:3), serve the Lord with gladness (Psalm 100:2). We focus on scripture’s work ethic as we wash linens, cook meals for campers (and guests in our home), work on installing a new water heater so campers can have warm showers, plan and implement camp programs, clean cabins or toilets or dishes, fix broken fixtures, help our sons with their school work, listen to a hurting friend share her struggles, play basketball with neighborhood children, and the list could go on. Our work for the Lord does indeed benefit others and ourselves, but whatever we do should be done with a kingdom focus. It is our prayer that we keep our focus beyond the immediate circumstances, people, and work around us and on Jesus himself. 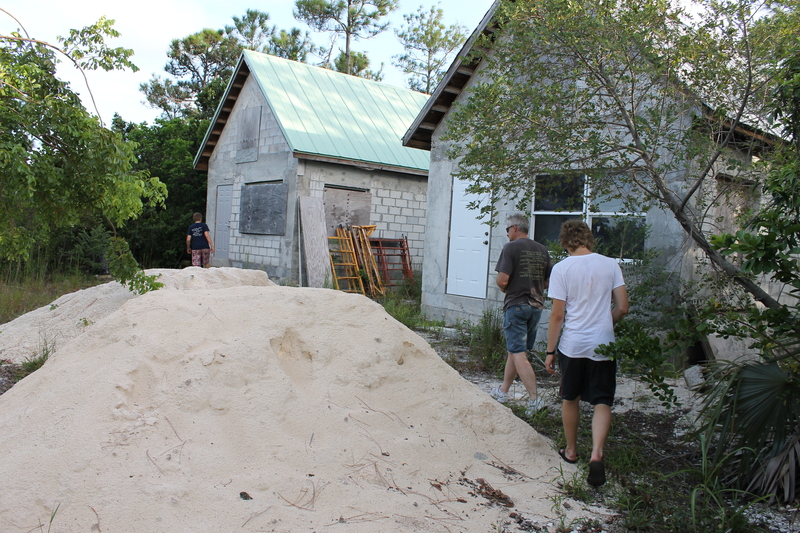 We have no mission teams coming to camp for a while, but that does not mean we have nothing to do. (By the way, if your church is interested in pulling together a mission team and would like a place to serve, let us know. We would love to host you. We have brochures available.) These past couple of weeks Tim has been working on fixing some issues in the newly constructed bath house. The water pressure has been low and the hot water seems to be insufficient. He thinks he has these two issues figured out and is working on correcting them. The tile and grout in the showers need some post-construction cleaning and repair work, and he has been doing quite a bit of that this week. Besides the bath house, Tim is trying to get the ball rolling on the construction of the electric house here at camp so the electric supply to the camp can be brought up to speed. As is typical in the Bahamas, things are not progressing as quickly as we would like to see them progress. We are praying for the ability to wait on the Lord because we know his timing is perfect. As soon as the electrical supply issue is addressed, work projects on the two partially constructed cottages can resume. It is very important that we get these cottages finished because we need housing for the ALC facilitators and other staff that work here. We are running out of options for housing for them, and it would be nice to have a guy’s house and a girl’s house. 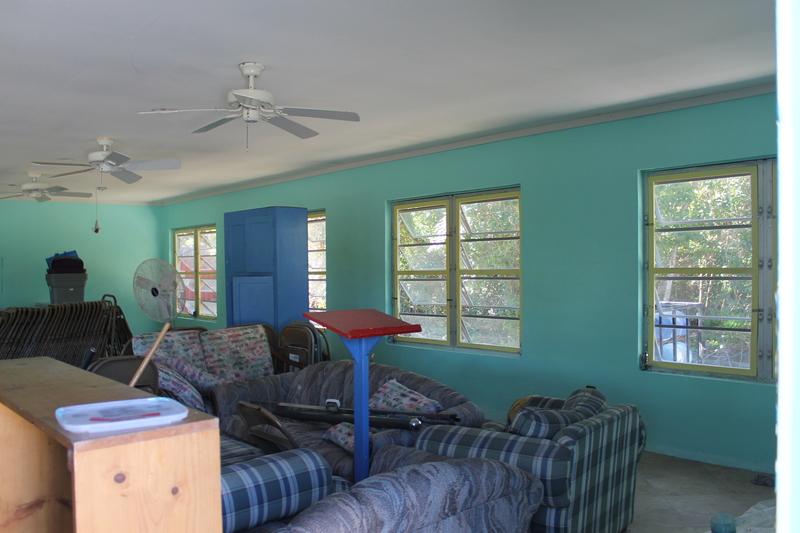 The new electricity supply would also allow us to get the camp laundry room finished and functioning properly. Please pray for the construction of the electric supply house as well as the cottages. Next Monday is a big day for Adventure Learning Centre. The centre is hosting its annual Easter Monday Funday. It is a way to raise money for the centre (to keep it running and allow us to keep prices down for school children that come to the centre throughout the year) and to expose the community to the gospel and the ministry of the Adventure Learning Centre. Last year over 1200 people attended the event. We are praying for a large turn out again, but there are a couple other big events on the island this weekend. Please pray for the preparations for this big day. There is still a lot to be done. ALC staff ventured out on Tuesday morning to hand out leaflets advertising Easter Monday Funday at ALC. They targeted the many area round-abouts where traffic builds up. This is Logan at the Blue Hill and East West Hwy round about. 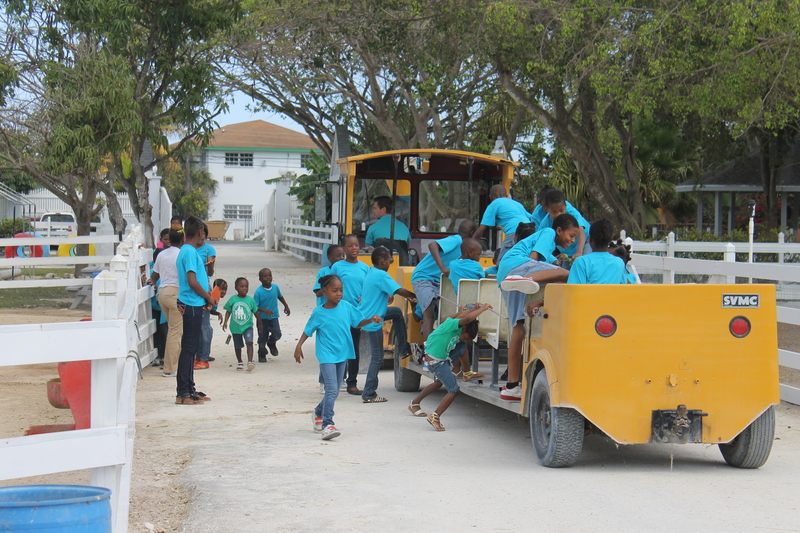 Yesterday the centre had a mini-funday for the children of some of the island’s orphanages. 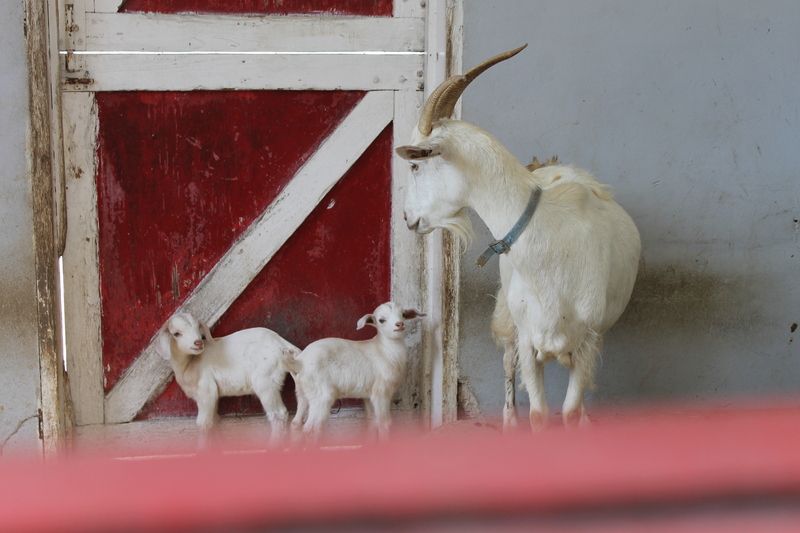 We were able to get a few pictures of these darling children. 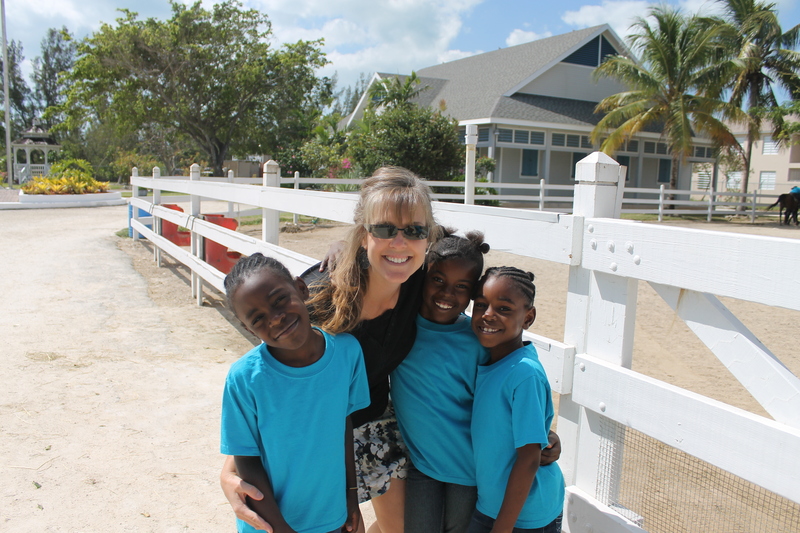 Bahamian children are so friendly and loving. 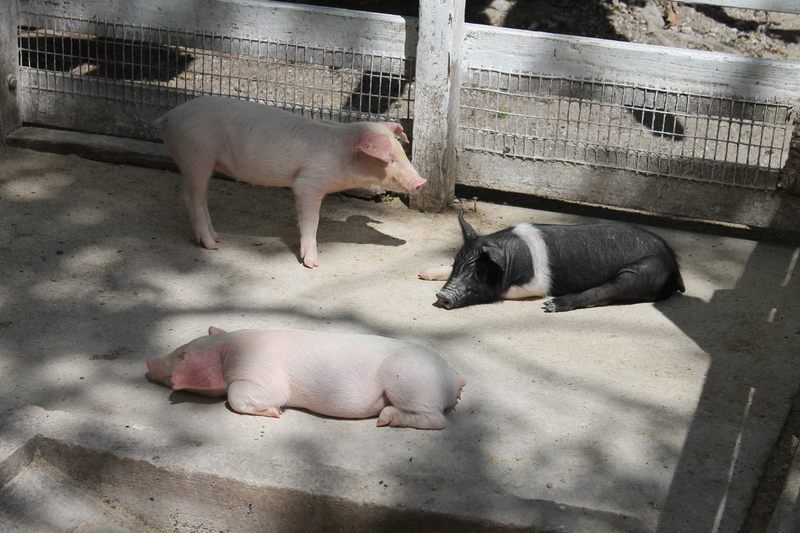 We try not to dwell on their circumstances because it can be so sad. As I (Mindy) interacted with these children, the Lord reminded me of how precious children are to him. O that we remain careful not to cause one of these precious lambs to stumble! We may not be able to do much to improve these children’s circumstances in life, but we can love them for Jesus and pray for their precious souls. All aboard! The children from the orphanage were able to enjoy riding the train at the Adventure Learning Centre during a mini-funday. 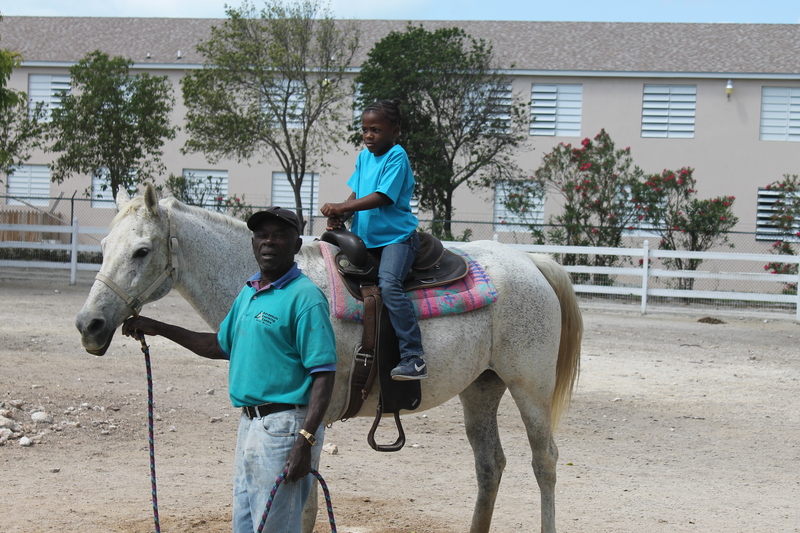 They also got to ride the horses. The older children were able to climb the rock wall. These children clamored to have their picture taken (and to take pictures with my camera). One of these girls asked me if I was her new friend. They were so sweet. 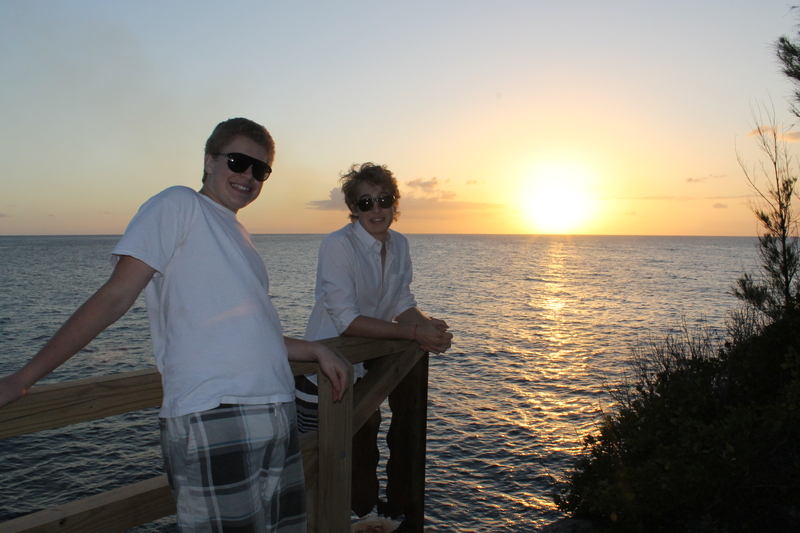 Thank you for those who have been praying for Zachary and Logan with their school work. We are beginning to see the light at the end of the tunnel. 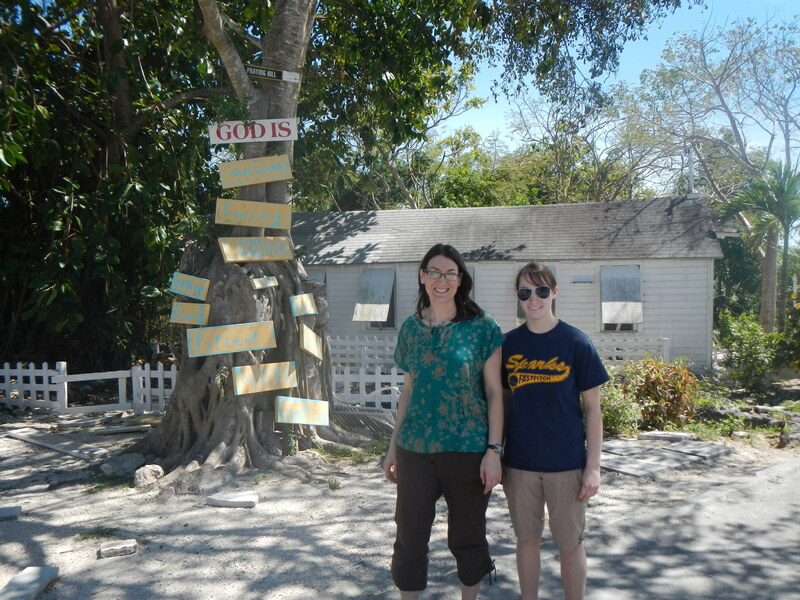 Praise the Lord we were able to find testing centers on the island for Logan to take the ACT (April 13), SAT (May 4), and AP Calculus AB (May 8). It was a huge job to find a school willing to administer the AP Calc test. We are praying all goes well with that. The school that is administering the AP test does not administer many of these tests. Please pray for all to go smoothly for Logan with his 3 tests, but especially the AP test. 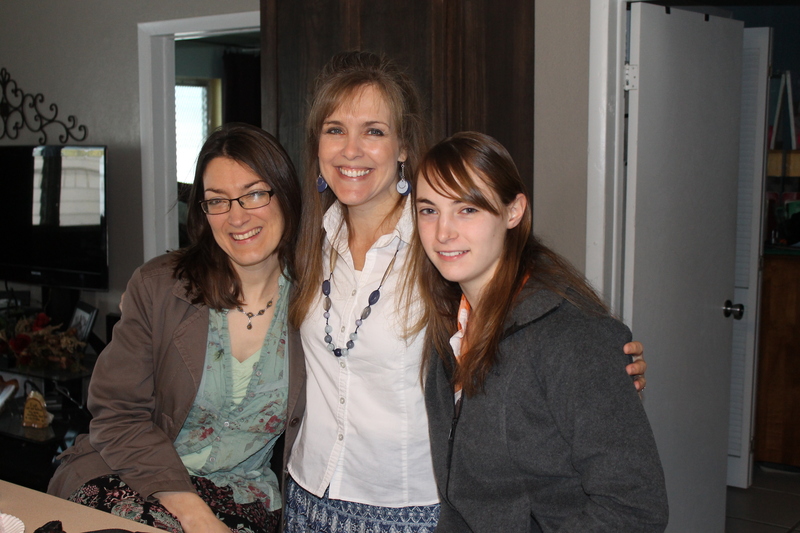 One of the highlights for me (Mindy) each week is the lady’s Bible study on Thursday mornings at Calvary Bible Church. It is not only encouraging for me in my Christian walk, it allows me the chance to get away from the camp/ministry bubble and feel like I am doing something routine and “normal”. I look forward to meeting with these ladies every week. We are studying the book of Psalms. Please watch for phone number changes in the near future. We have been having issues with the telephone company’s internet and VIBE telephone (that is the VOIP phone we use to connect with USA people) and will be cancelling our service with them. We will be keeping our Bahamas land line/local number. We will be switching to Cable Bahamas for internet and will likely be purchasing MagicJack Plus from the states to use as our VOIP. The Minneapolis number listed under our contact information is currently valid but will probably be disconnected soon. We will update that information as it becomes available. We have been asked by a couple of people if we are going to post pictures of the interior of our house now that the renovation is “done”. We will do that in the near future, but we will put it in its own post. It won’t take up much space because the house is small and cozy. So, if you are interested, you can be watching for that. 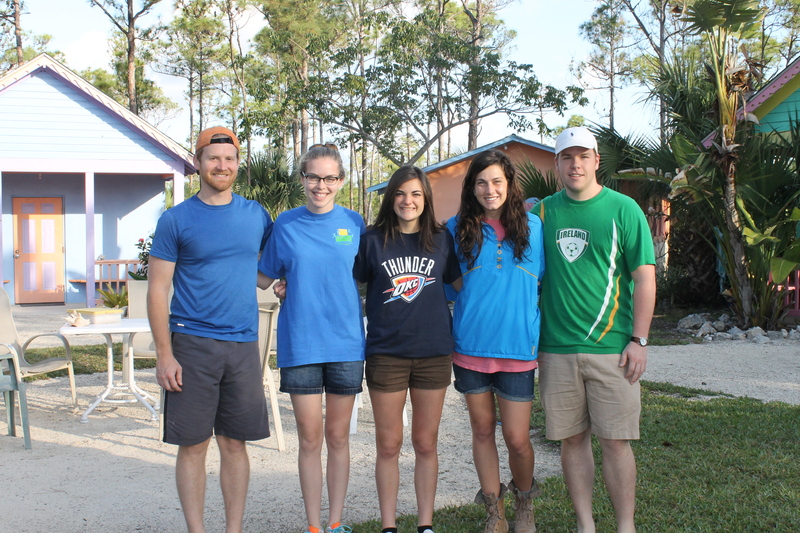 March 17-22 we welcomed the Greek Life group from Oklahoma State University. Kevin’s birthday cake for his 18th birthday. What do you do when you don’t have birthday candles? You improvise. I had tea light candles. 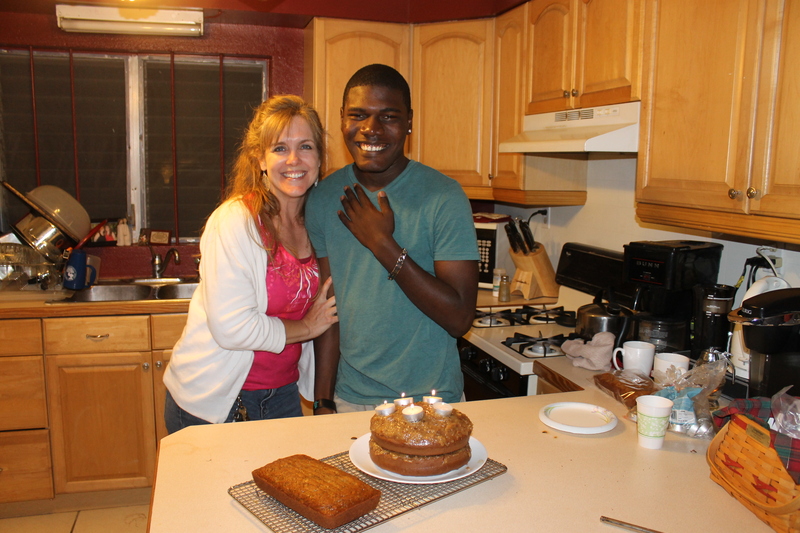 I made him our family’s favorite cake, one he had never had before…German Chocolate cake. Those present for Kevin’s party: Geoff Sousa, Katie Morris, Zachary, Logan, Kevin, Tom, Bob, Faye, Mike, Tim, Mindy. 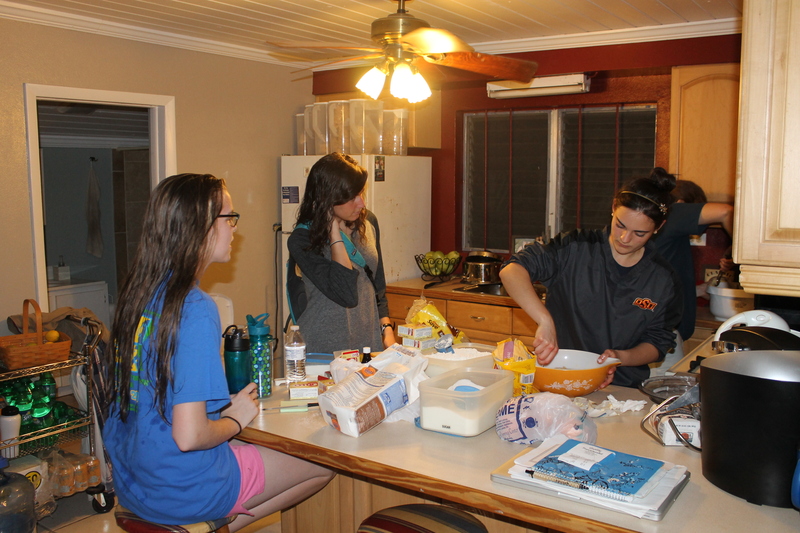 The Greek Life girls making cookies to take to the residents at All Saints Camp. One of our ALC facilitators, Mike Chatigny, with his mom Cheryl Thompson. Cheryl came for a visit this past week. 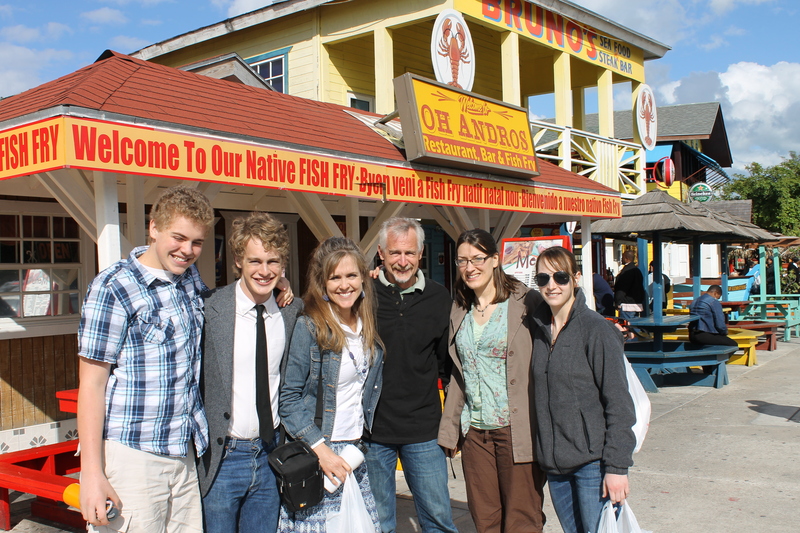 (Visits from family and friends are always such a blessing and encouragement). After we picked-up Missy, Liam and Kayla at the cruise ship, we walked through downtown Nassau, over the bridge to Paradise Island, through Marina Village and part of the lobby of Atlantis, and then back to downtown Nassau before jumping in our car to see a little of north side of the island and catching lunch at Arawak Cay. After lunch we took them back to the camp to show them the Adventure Learning Centre and Camp and our house before taking them back to the port. The day went by too quickly. Thank you again for your interest in our ministry work and lives and for your prayers and support. May God bless you all! Until next time, have a great week and HAPPY RESURRECTION DAY!!! 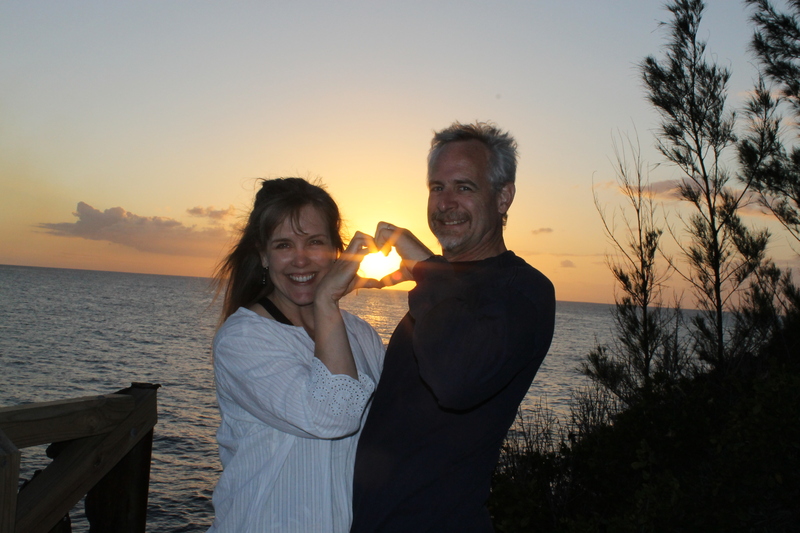 …we are official Bahamian residents, our travel plans for June, ministry update! 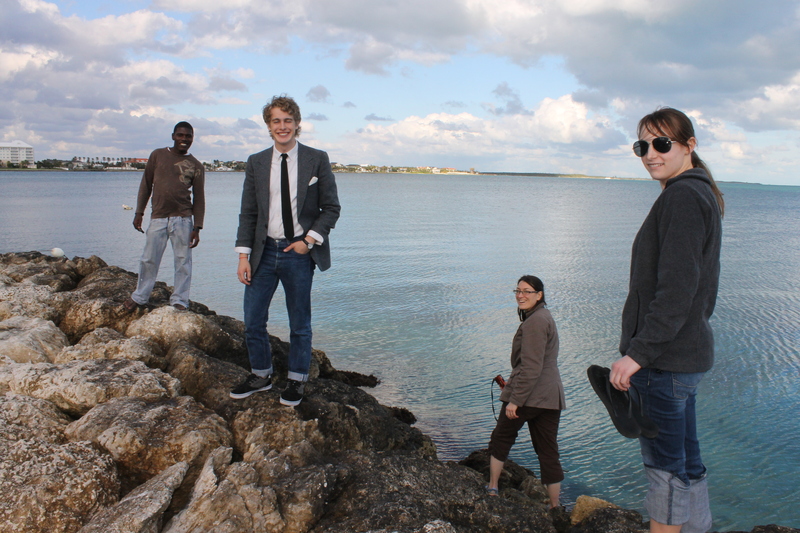 March 16, 2013 6:55 am / 4 Comments on …we are official Bahamian residents, our travel plans for June, ministry update! God plans our days and works things out according to His will and purposes. It is so comforting to know who is in control. Even when we pridefully take control, He is readily available to admonish us and convict us until we humble ourselves. In our humility of heart, He forgives us and lovingly puts us back on track. God’s ways are perfect. Oh, but that we would learn that! 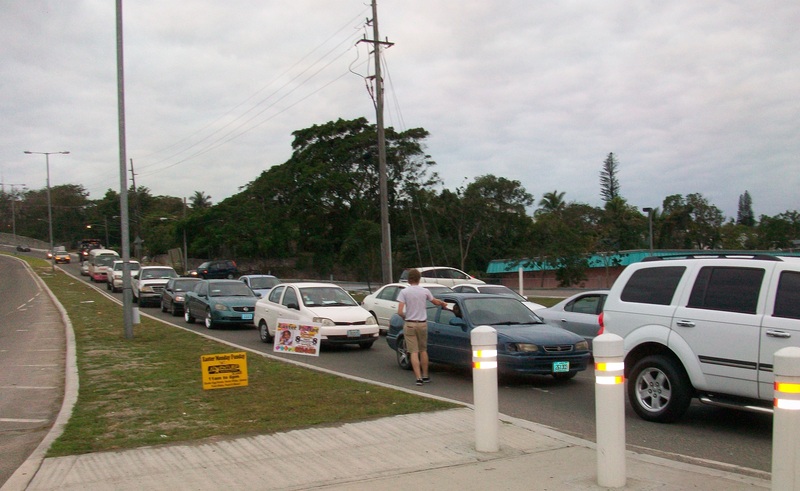 We do not want to come across as sounding impatient or intolerant to our host country’s way of doing business, but, like other Bahamian businesses, The Bahama’s Immigration Office seems to be as slow as molasses in January (in Wisconsin, that is). We spent a good part of Monday waiting and waiting and waiting at the immigration office. We had received a letter from the Bahamian government early last week telling us that Tim was officially awarded a 2 year Bahamian residency to work in the Bahamas as a missionary. We were instructed to go to the immigration office where we would receive the final approval for residency subject to payment of the residency fees for me and the two boys. After waiting, paying the fee, waiting some more, leaving for a lunch break, and returning to the office to wait a little longer, we walked out of the immigration office with 4 shiny Bahamian resident cards in hand. It is such a relief to have this final piece of the puzzle in place. With this final piece of the puzzle in place, we can humbly say that God has granted us a remarkably smooth road/journey here to this ministry. As we reflect back over this 8 month journey to the Bahamas, we are in awe at how God has led and guided us. It has indeed been remarkably smooth. 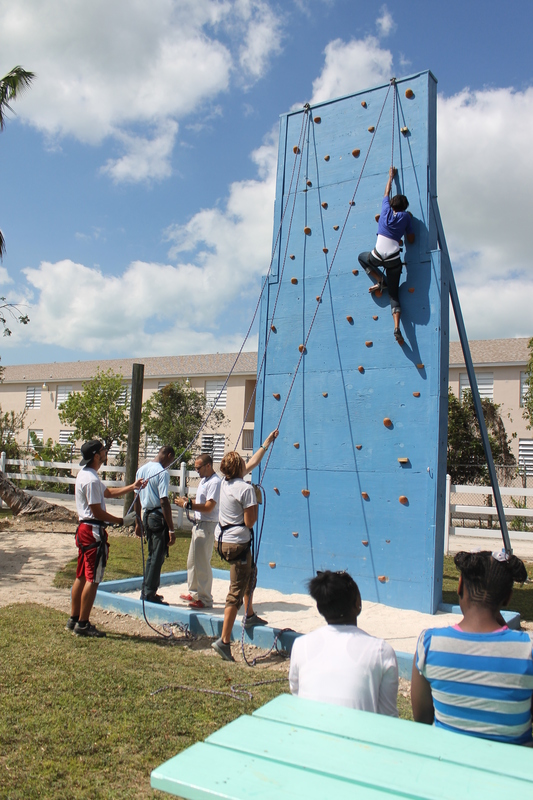 We continue to work steadily to learn the ropes here in the Bahamas as well as the ministry here at the Adventure Learning Camp. We feel like we are making progress. We are so thankful for the camp ministry training we received while at Living Waters Bible Camp. 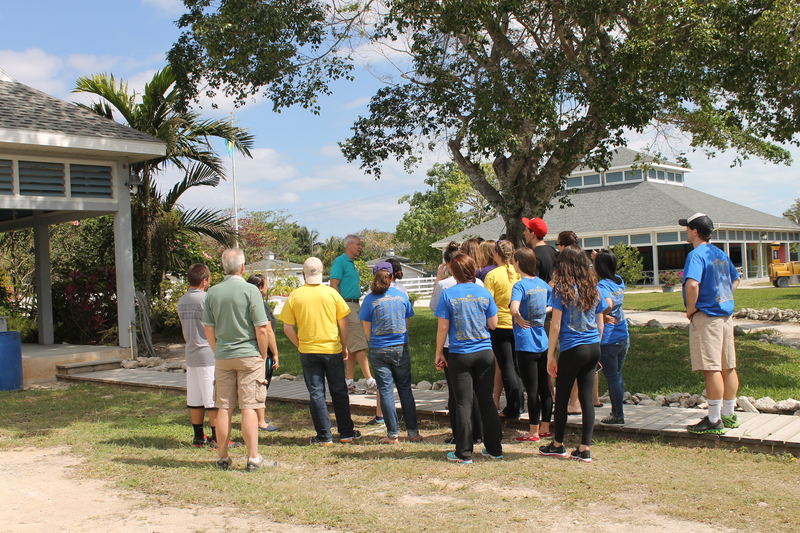 Things we learned by watching others work and things we learned in our own duties at Living Waters have been valuable for us as we take on the task of directing this camp ministry here. 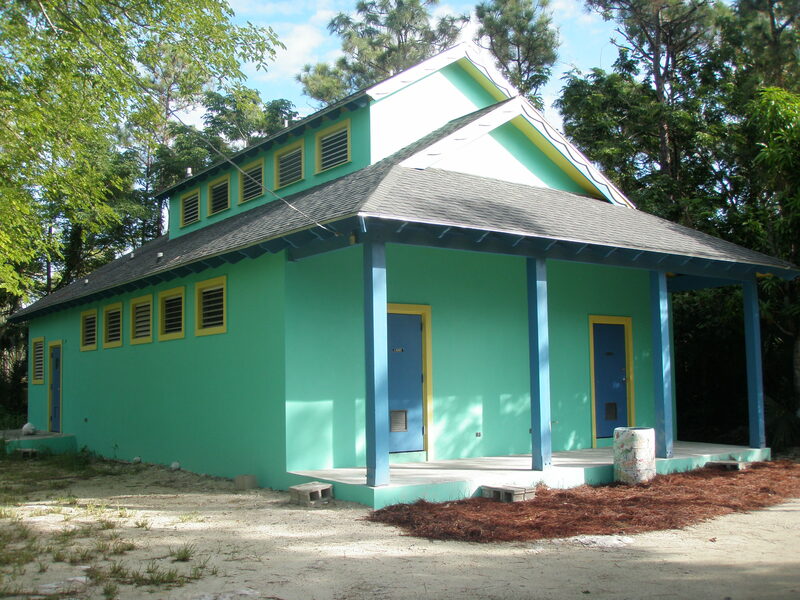 We have served several weekend groups from local Bahamian churches as well as for a couple of week long groups from the states. This weekend we have a choir group from a local church using the facility and a small mission team group from the US will be here this next Sunday to Thursday. For us, the highlight of having these groups here is getting the opportunity to connect with the people and minister to them and their needs. It is a joy getting to serve people in the name of Jesus! It is serving in the name of Jesus that keeps us going and focused on doing the best we can. 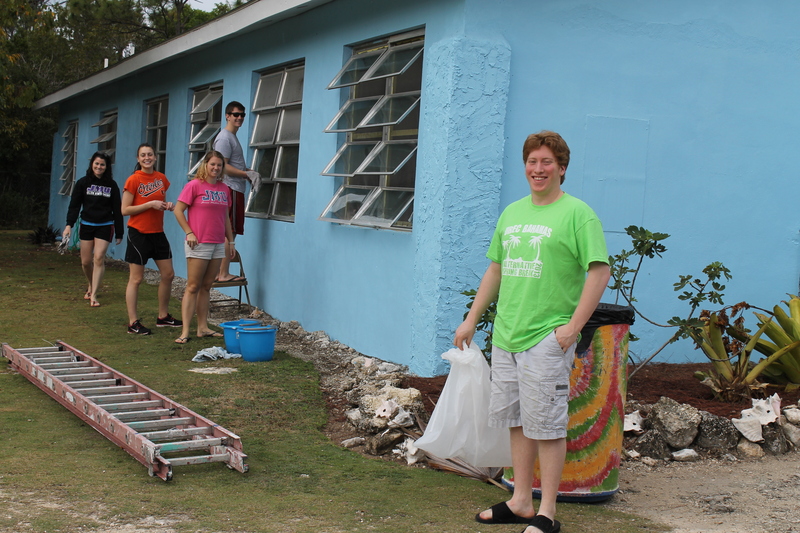 A group of students from James Madison University in Virginia were here for a week to serve at a Bahamian school. 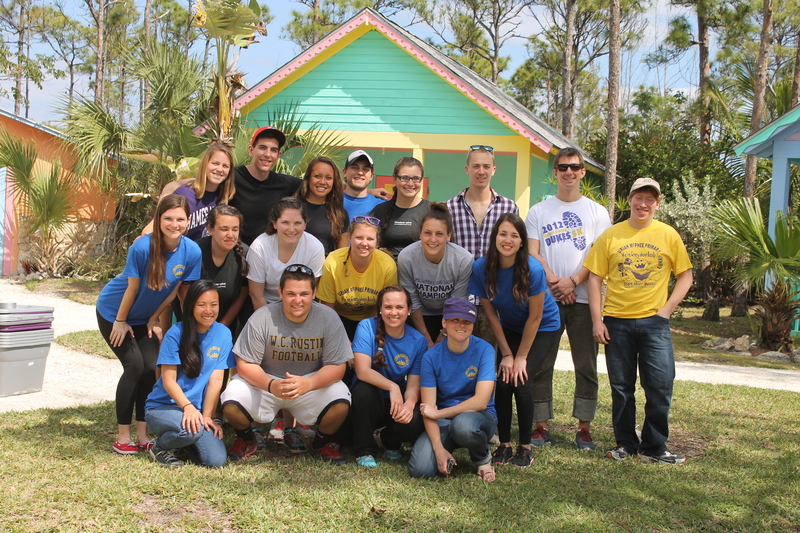 JMU students did some service projects around camp. 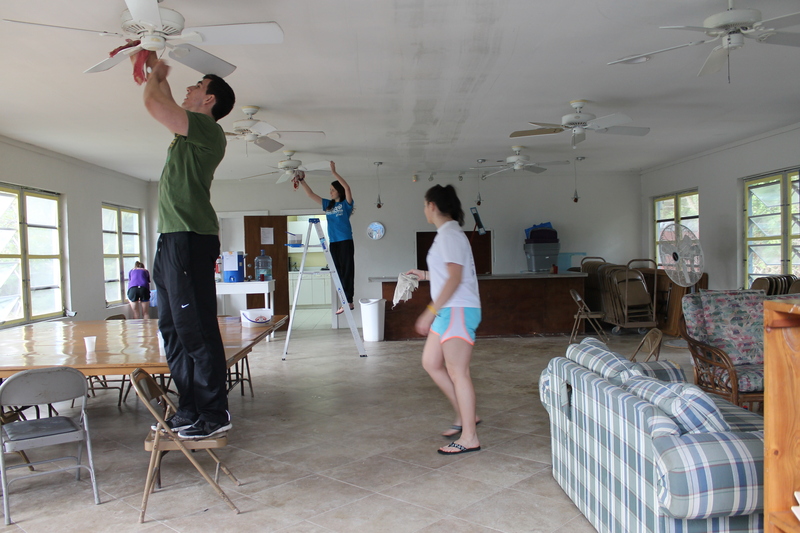 They cleaned the dining hall in preparation of us painting it that week. JMU also cleaned dining hall windows! The same day the JMU team arrived at camp, we also welcomed a couple of friends from our sending church, Grace Church, Viroqua, Wisconsin. 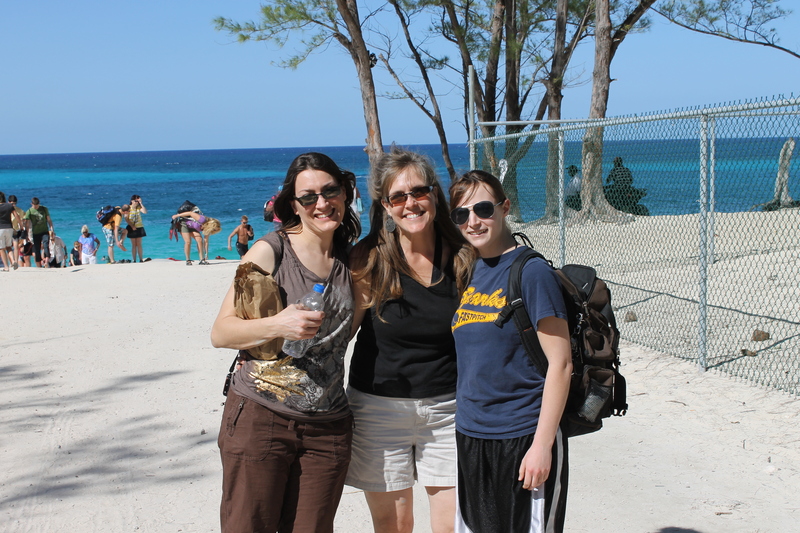 Sheila Eisermann and Katie Aloisi were here to see us and to investigate future church mission trip opportunities in the Bahamas. The beginning of a great week of encouragement. I loved having these ladies here! 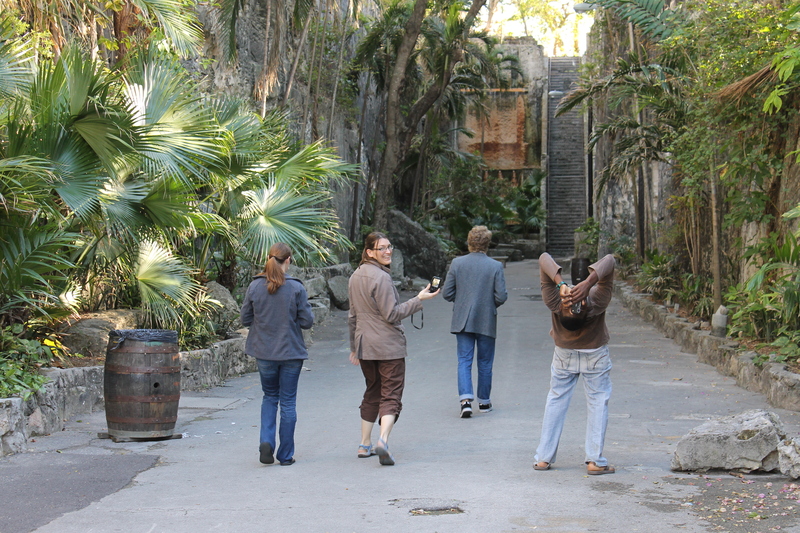 Tim had to work on Sunday morning, but the boys and I took Katie and Sheila to a Haitian church. 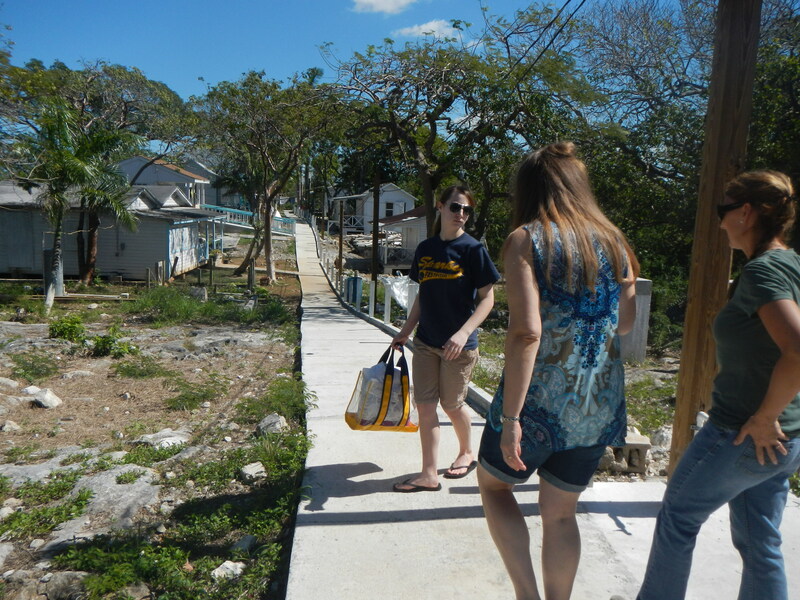 After church, Tim met us at Arawak Cay to eat lunch at Oh Andros. 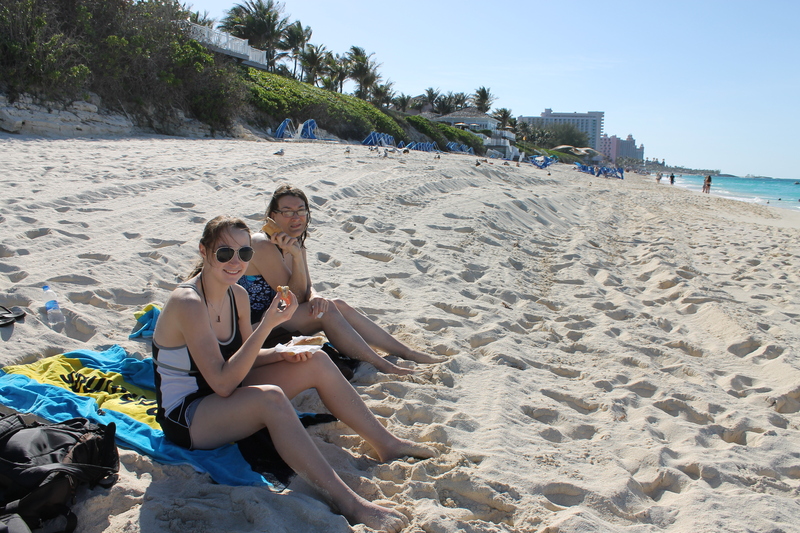 Katie and Sheila had Bahama’s famous conch. After lunch, Tim and Zachary went back to camp to get some camp work done while Logan and I (and Kevin, foster son to our maintenance guy) took Sheila and Katie to a few sights. This is on the north side of the island at Fort Charlotte (one of the 3 forts on the north side of the island). Fort Charlotte is across the street and up the hill from Arawak Cay where we had had lunch. This is the Queen’s Staircase. This is Montague Bay just east of downtown Nassau on the North side of the island. Katie and Sheila were able to get their feet into the water. As you can probably tell from the way we were dressed, it was too chilly to swim, even for hearty Wisconsinites (Sheila and Katie) who had just come from a very snowy climate. 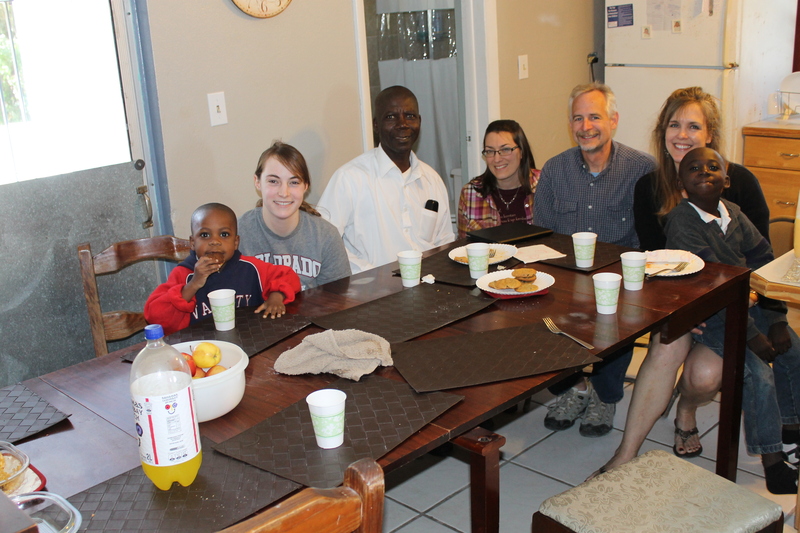 On Monday, we had Pastor Basile over for lunch to learn about his ministry with the Haitian community and to introduce him to Katie and Sheila. He is the pastor of United Alliance Church where we attended church the day before. This meeting was a highlight for all of us. 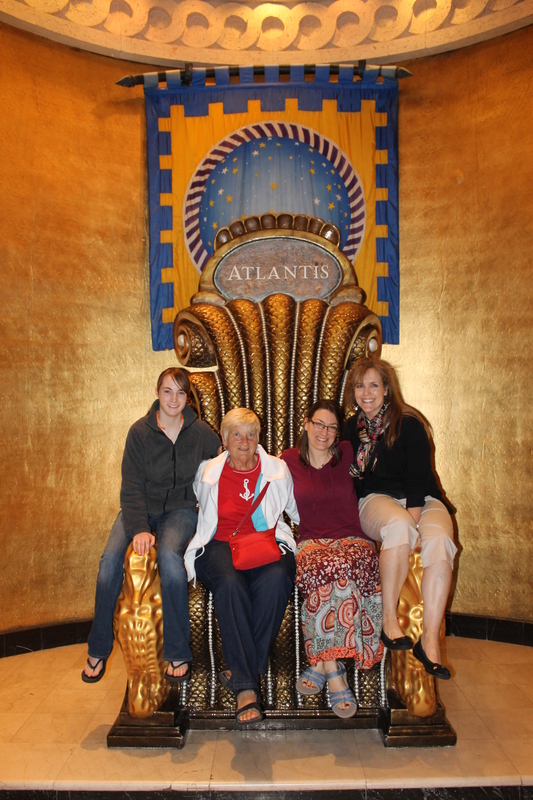 On Monday evening, Faye and I took Sheila and Katie to Atlantis. (Tim could not join us because of camp obligations). Poseidon’s chair at Atlantis. 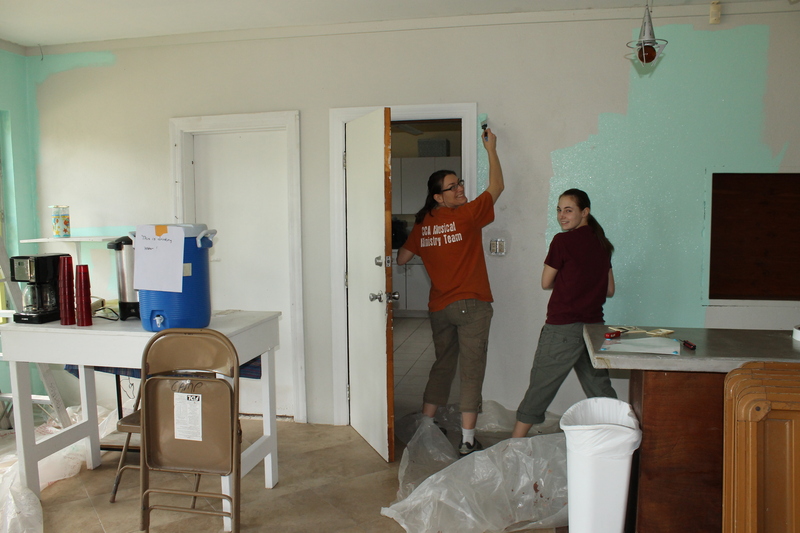 On Tuesday, we put on work clothes and began the long day project of painting the dining hall. Katie and Sheila were such a huge help with this huge project! From beige to Bahamian colorful! 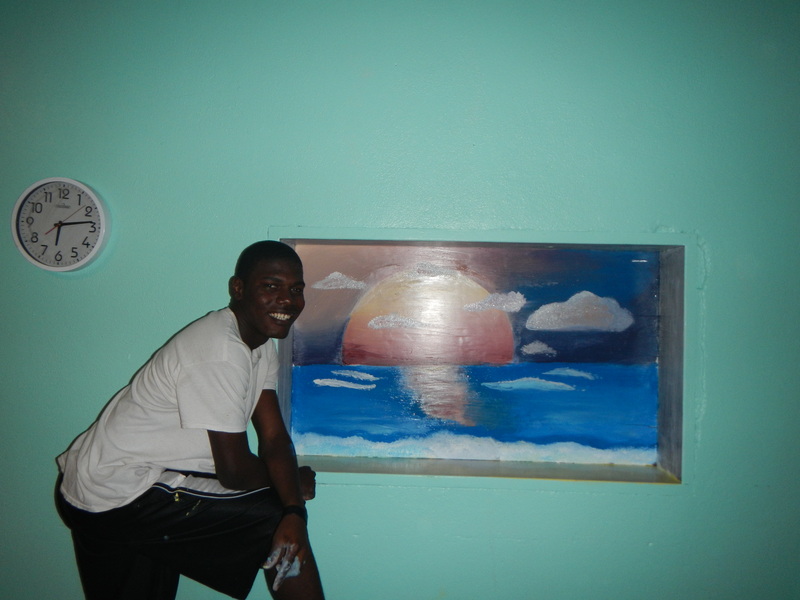 Kevin, the artist that he is, made this beautiful sunset picture in a very short time in the dining hall. On Wednesday, Sheila and Katie were able to go with me to All Saints Camp to help Tim and Felicia Ryan feed the residents lunch. 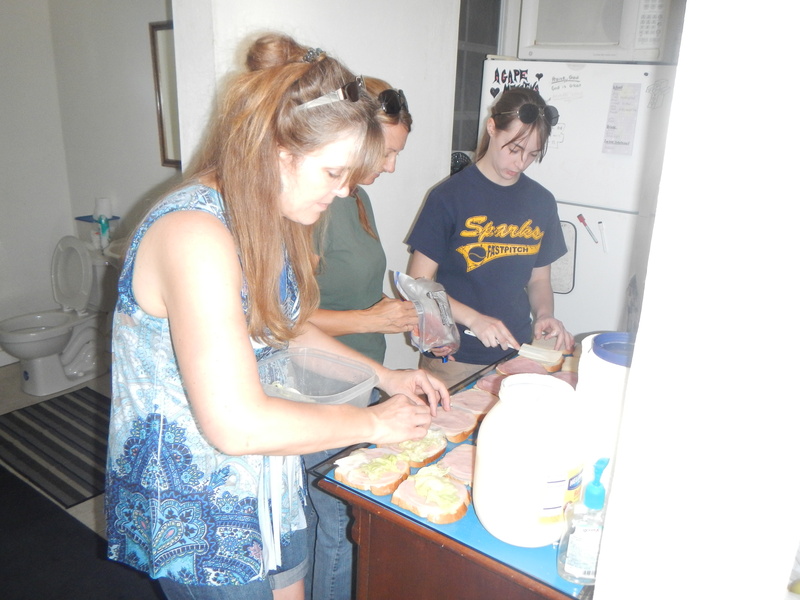 On Wednesday morning, we went to All Saints Camp to help Tim and Felicia Ryan make lunch for the residents. Delivering lunch to the residents of All Saints Camp. The water and weather was gorgeous (It was actually the first day of their visit that was warm enough for a visit to the beach). 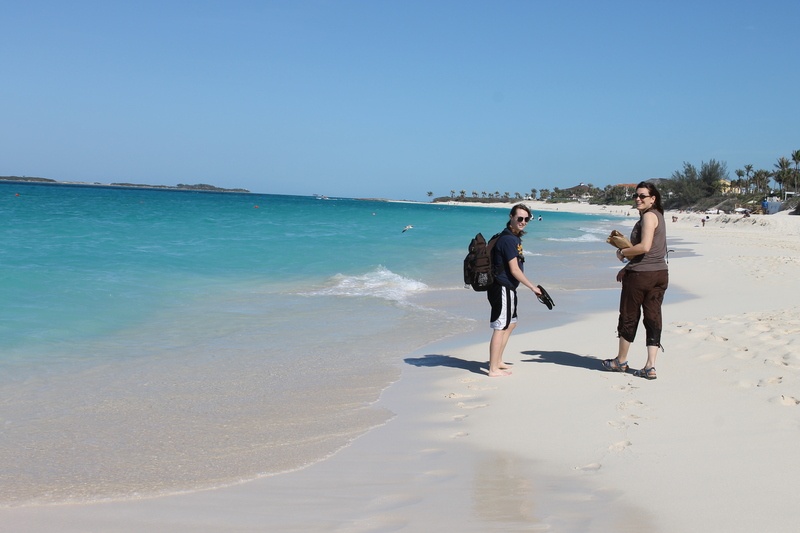 Sheila and Katie were able to tolerate the chilly water in the upper 70 degree weather, but my blood has gotten too thin, and like most Bahamians, I think it is too cold to swim this time of year. I introduced them to another one of our favorites here on the island: coconut tarts! YUM! 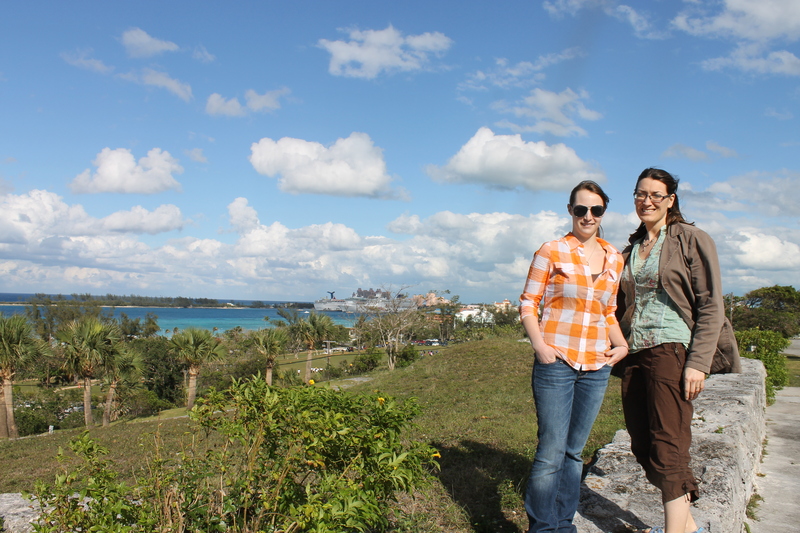 Katie and Sheila had seen the north side of the island, the east side of the island, and stayed with us on the south side of the island. That left only the west side of the island. 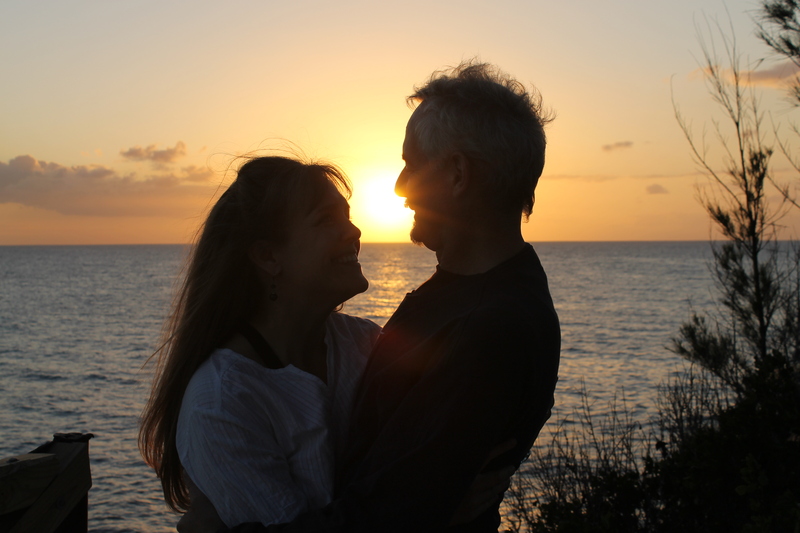 We made it to the west side of the island on Wednesday evening in just enough time to watch the sunset over the western horizon. It was a perfect ending to a gorgeous day and a wonderful visit. They left the next day to fly home. 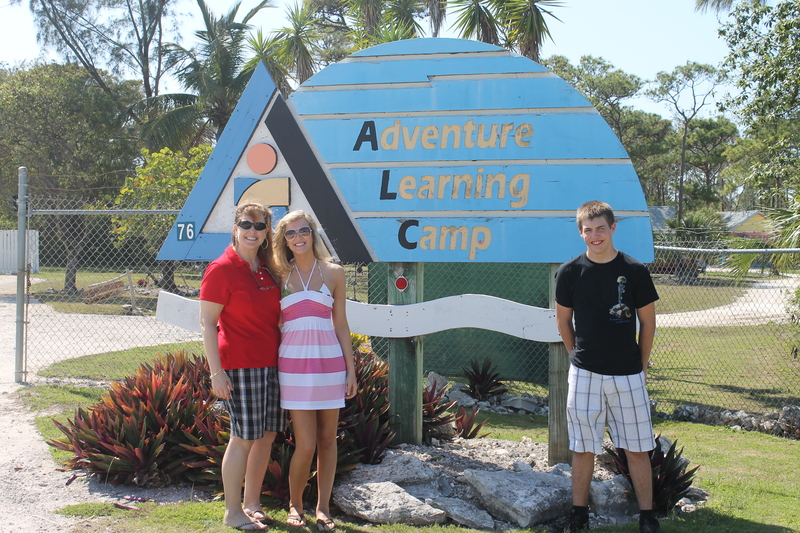 Before the JMU students left the island, they got a tour of the Adventure Learning Centre. We had our second Seeley family outing on Sunday. 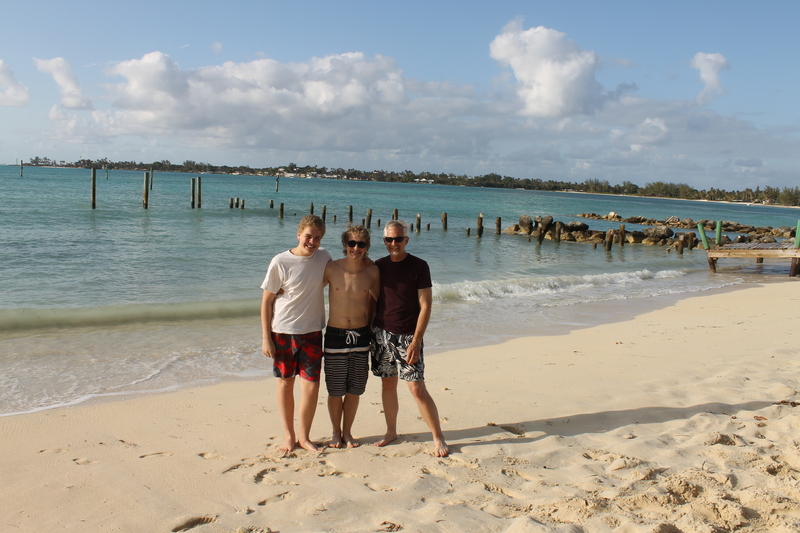 We went to Jaws beach where the guys swam a little (it was still too cold for me). 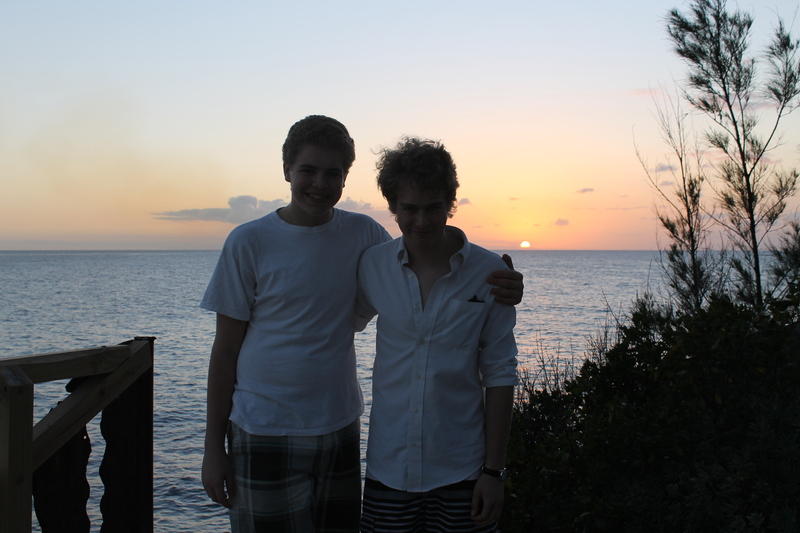 After the beach, we went to the cliffs to eat a light supper and watch the sunset. 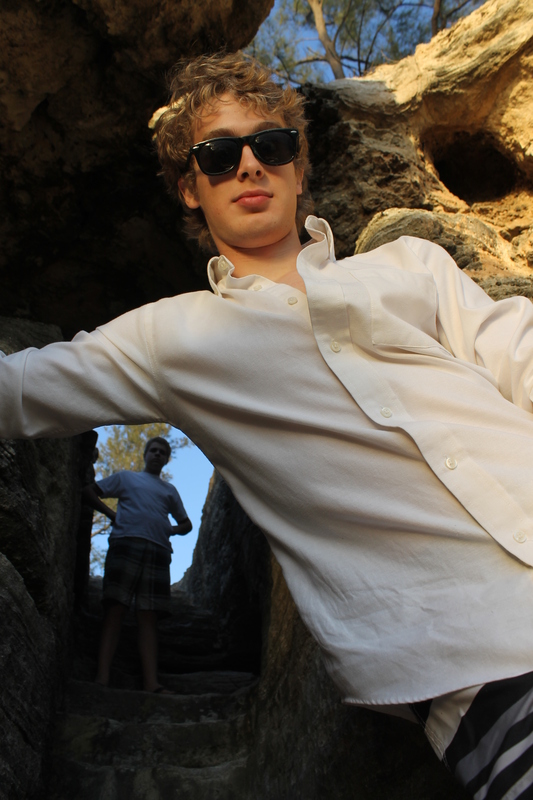 After the beach, we went to the cliffs to eat a light picnic supper and watch the sunset. Tim and I had been here before, but this was the boys’ first time. 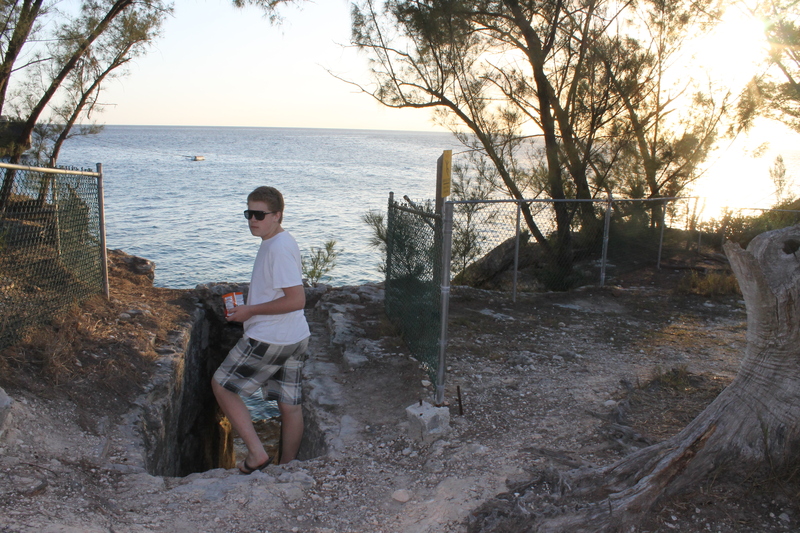 Pirate stairs/slave stairs…whatever you want to call them..at the cliffs area where we were watching the sun set and eating our picnic supper. 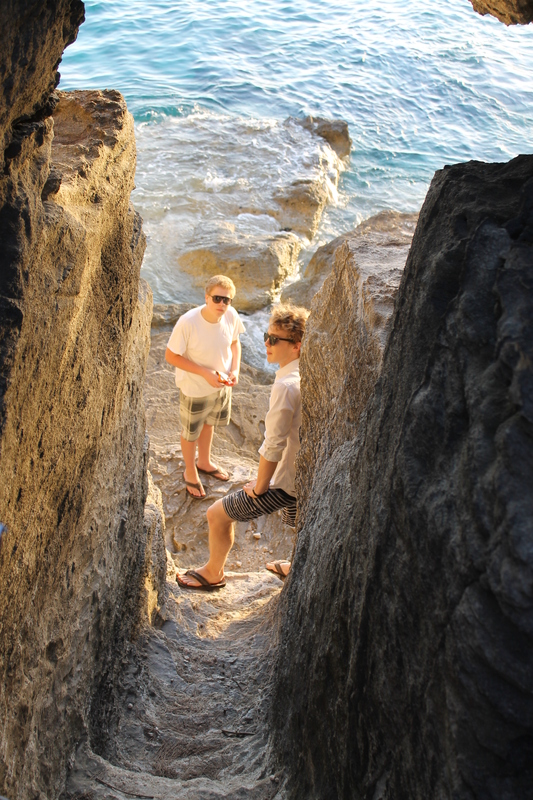 The boys enjoying the view from below. Playing around with angles and camera shots (getting ready for senior pictures—boy do we have some good choices for back drops!). Having fun with sunset photo shots! Love spending time with these guys! 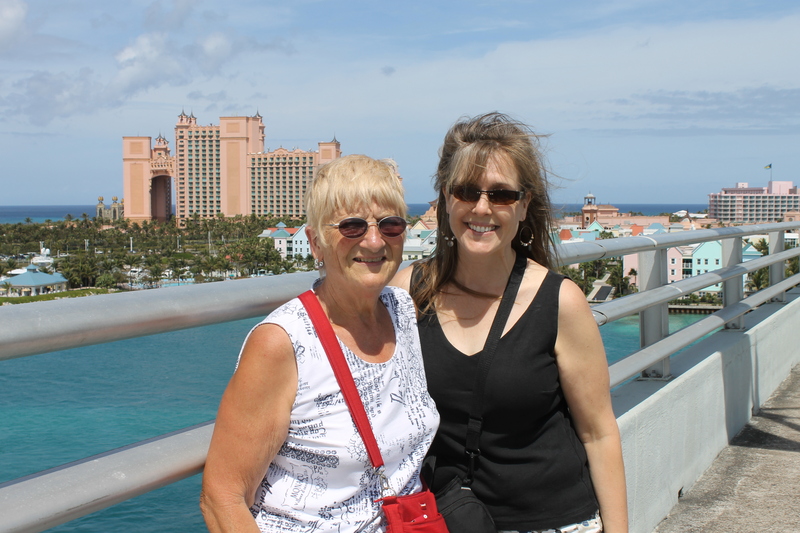 We spent most of Monday at the immigration office, but on Tuesday, I took Faye downtown to do some shopping and to walk across the bridge that connects downtown Nassau to Paradise Island. 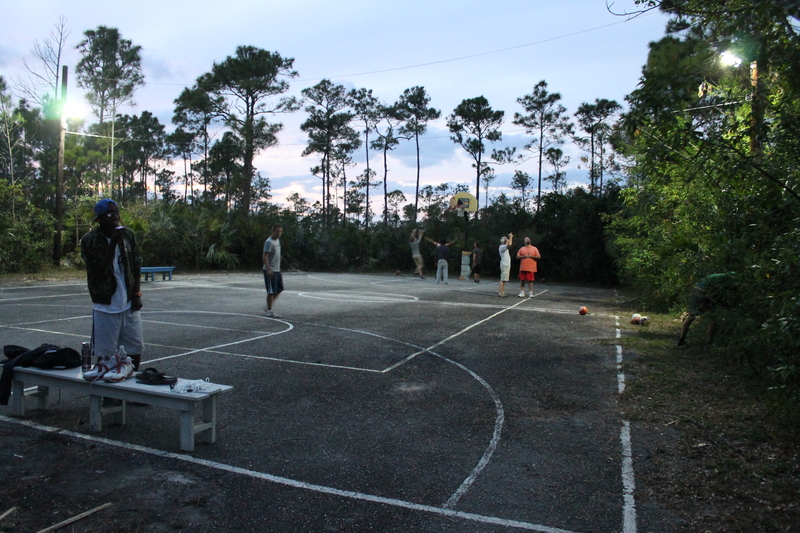 This week we tested out the lights on the camp basketball court. Tim, the boys, the ALC facilitators, and friends from the Castle ministry got together for an evening of basketball. Hello, everyone! This will be just a quick note to let you know that we now have new phone numbers. BTC (Bahamas Telephone Company) was here this week to install our new landline, DSL, and Vibe phone. The Vibe phone is like Vonage. It is a Minneapolis, MN number that rings directly to our house here in Nassau. We hope this makes it easier to stay in touch with all of you back in the US. For some reason, just having that phone hooked up makes me feel closer to everyone. You may obtain the new phone numbers by clicking on the “Contact Information” tab at the top of the blog page. We will try to get a full post up some time later this week. Things should be a little slower this next week. Our residency has been approved by immigration. We have been approved for 2 years. No one I have talked to has ever been approved for 2 years. Usually you have to go back to immigration yearly and renew your residency. We aren’t sure why the extra time, but we are just going to say “Thank you, Jesus!” and be done with it. Please pray that BTC (Bahamas Telephone Company) comes in the next day or two. They were suppose to be here on Tuesday to hook up the telephone and our internet at our house. They have not come yet. 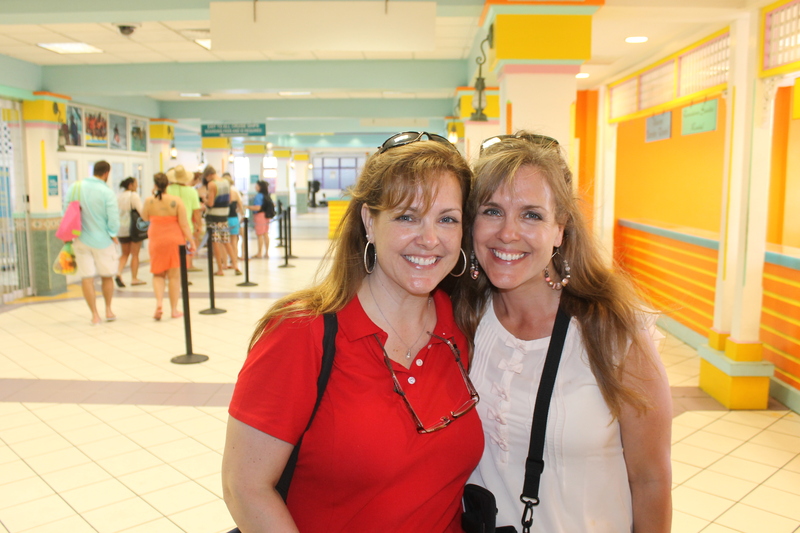 Last Saturday, two ladies from our sending church arrived for a visit. 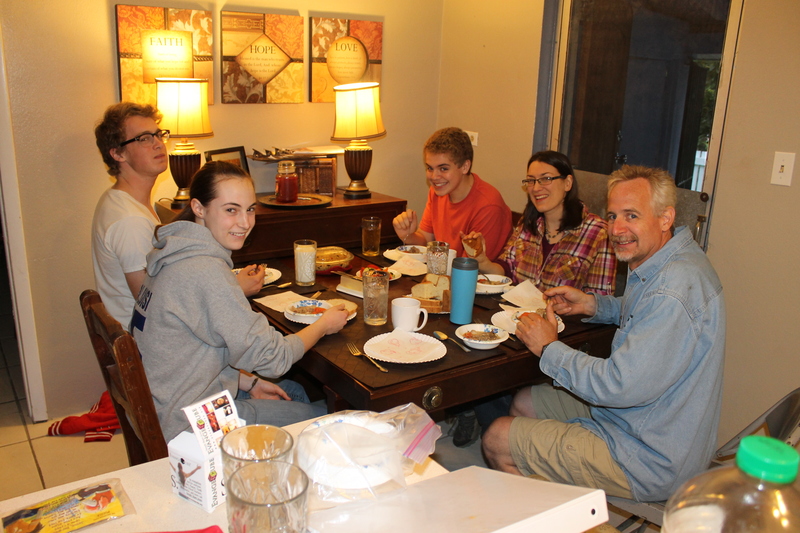 I have had a great week with them, and they have been a HUGE blessing and encouragement to us. They leave tomorrow (sad face!). 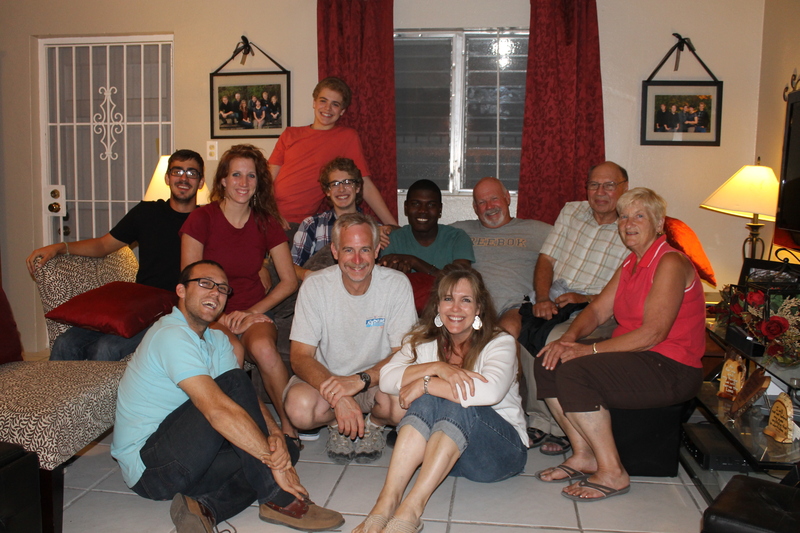 Although Tim has not had much free time to spend with us this week (He has been busy serving a group here at camp and is now in Ft. Lauderale Florida for his monthly meeting with the leadership of Calvary Chapel), I believe I have been able to adequately host them and get some of their questions answered. Stay tuned, I will try to get some pictures posted in the next several days. I need to run for now.